BETATULLE is a gauze of leno weave impregnated with povidone iodine 10%. It is presented sterile as individual dressings in peel-apart pouches. Bactericidal in less than 5 minutes in vitro, on all bacteria. Organic matter (proteins, serum, blood, etc.) reduces the activity of free iodine, the active form of this specialty. Iodophors are unstable at alkaline pH. The skin coated with povidone iodine takes on a brown color which is easily removed with water. Infection of minor burns, cuts, grazes, fingertip injuries & bites. Minor trauma & Postoperative prophylaxis. Injuries of superficial skin loss. Leg ulcer, pressure sores, infected ulcerative wound. History of allergy to one of the constituents, in particular povidone. There is no cross reaction with iodinated contrast media. Intolerance reactions (anaphylactoid reactions) to iodized contrast media or anaphylaxis to seafood are not a contraindication to the use of BETATULLE 10 percent. In the newborn of less than 1 month. Prolonged during the 2nd and 3rd trimester of pregnancy. Breastfeeding is contraindicated in case of prolonged treatment. 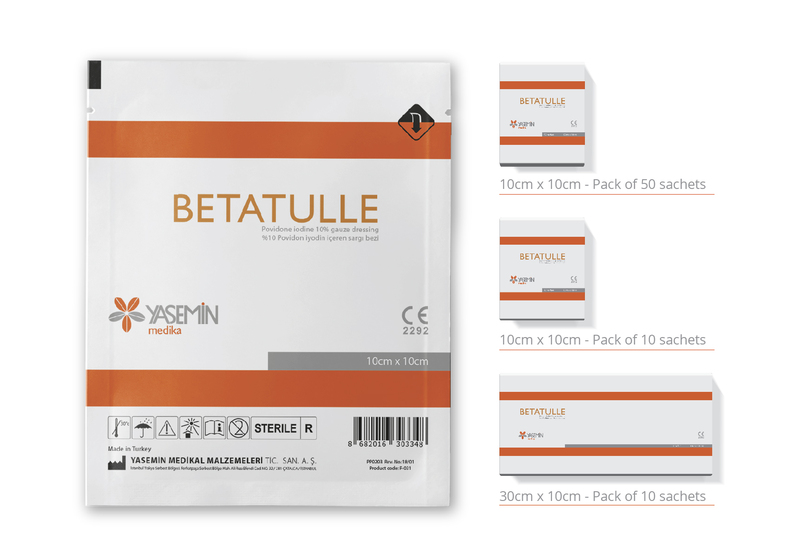 BETATULLE apply directly to clean wound surface & protect dressing with sterile secondary dressing tape, bandage to hold the dressing in position. It is advisable to use under the supervision of a medical physician. This medicated tulle dressing is reserved for external use. Apply the impregnated compress on the wound.